Kingfishers and zebra finches, triggerplants and tiger snakes, sandcrabs and cabbage moths, wattles pods and waterlilies—all find a place in this collection of poems celebrating Australia’s native and exotic flora and fauna. 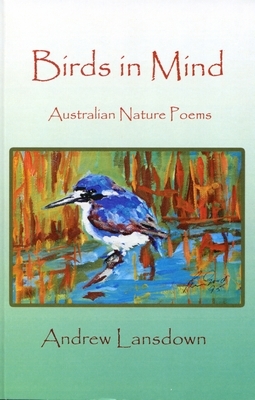 Birds in Mind brings together over 200 poems by one of Australia’s finest nature poets, poems as varied in style and tone as they are in subject and theme, poems that will turn readers into nature and poetry lovers if they aren’t already! I was very touched, and of course honoured, when Andrew Lansdown asked me to launch his wonderful collection of poems, Birds in Mind: Australian Nature Poems. Ours has been a long acquaintance and friendship, going back to the mid-1970s or so. For a while, we were always the youngest WA poets to appear in anthologies such as Quarry, edited by Fay Zwicky in 1981. And I note that several of our near contemporaries in that anthology have gone on to either better or worse things, but Andrew and I have somehow managed to stay in the poetry-writing business. Initially, there are several things to note about Birds in Mind. Firstly, the sheer size and scope of the subject matter. The joy in birds is apparent from the title, but they are only some of the creatures and plants the poet celebrates and sometimes mourns. You will also find superbly spare descriptions of, and reactions to, shells, frogs, lizards, kangaroos, crabs, fish, sunflowers, bamboo, orchids, trees in abundance—karri, jarrah, marri, redgum—and much, much more. Another initial observation concerns the variety of places in which these poems have been published—they have obviously appealed to many different editors, and the Acknowledgements page is really mind-boggling. Apart from appearing in countless Australian journals and anthologies, many have been published overseas, in Japan, the USA, the UK. A third observation is in regard to the quality of the book’s production itself and the generous 223 pages—no “slim” volume of verse this! The beautiful cover painting is by Andrew’s late friend and mentor, Peter Good. Andrew’s poetry is much influenced by Japanese short forms such as haiku and tanka that aim to capture the particularity, the is-ness, of (usually) a natural object, animal or scene. The goal is to achieve a rendering of this essence in just a few words. Andrew is adept at both forms (and many traditional Western forms, too) but it is more the spirit, the underlying intention, of them that gives grace and lucidity to all the poems gathered here. We’ve all seen that hunched bird up on the wires on a cold day, but who has so perfectly fixed it in our memory as Andrew? The poet’s capacity to be continually astonished by the natural world is both very moving and inviting, too. We, the readers, are also encouraged to look with new eyes on things we might have taken for granted. These poems are full of those “Ah!” moments beloved of the haiku poets. Humble slaters, wood lice, “forage about in their armoured coats/ like miniature armadillos”; a jewel beetle basks “in rainbows, like a drop of oil”; the bobtail has “unexpectedly, a yellow flower/blooming in the back of the throat”; straw necked ibises are “like elderly Oriental/ gathered for a festival”. This is poetry forged from a brilliant combination of observation and compassion, what [the Chinese philosopher] Mencius referred to as the “thinking heart” (or maybe camera with heart!). Although great beauty and a sense of joy infuse these poems, it should not be thought that they are in any way merely “pretty” or dainty. Nothing could be further from the truth, for thought Andrew delights in the natural world, he does not shy away from its less attractive manifestations (though the negative is frequently related to some human intervention, as in “Snake in a Box” or the mindlessly cruelty “Blowfish”). There is grit and blood and pain in this poetry, too: I won’t read “Four Men” to you, a graphically precise account of mulesing, lest anyone here, including myself, passes out. Nature here is multifarious and complex, powerful and sometimes violent, as well as exquisite in its forms, colours and profound variety. for my poems to celebrate. Enjoy this major contribution to Australian poetry. I have the greatest pleasure in announcing that Birds in Mind is launched! Thank you. in the mind of God! the grasstrees. I feel their desertion. I wonder if I should go on or go back. Either way, who will give me welcome? green rind is yielding to yellow. places in its lap a sprig of mint. it smells so clean and sweet. Who sets the heart for wonder? What triggers the spring of praise? I kneel to touch the heart of a flower. into branches. No weeping, no compromise. as a farthingale shapes a dress. to be covered. Trim the sky for a canvas. from your imagination. Gales are gathering. your tent. Enter in. Enter in to the calm. Author Andrew Lansdown is renowned for his award winning poetry. In this brand new collection of over 200 pages there are poems told through various forms, but all with a focus on nature. There are many haiku and tanka within these pages, and the same accurate eye and ear is brought to bear in other forms on much minutiae of the natural world. a park bench with yellow. Andrew Lansdown is one of a very small handful of West Australians who, for more than 30 years, has committed himself steadfastly to writing, with poetry a major part of his output. His many books include the popular series of children’s adventures beginning with With My Knife, and collections of essays. He has recently launched a website and has an impressive collection of literary prizes. He has, from his first work, established a distinctive and individual voice. signals in semaphore to an inattentive world. cheer in bold colours, brandish their golden gloves. and accept the birds they bring. the world floating at its feet. is latent with light and grace.